Ultimate Item of Donated Awesomeness! There is a .1% chance to get the Ultimate Item of Donated Awesomeness! If THAT drops from the Wheel of Doom for you, follow the instructions in the item description on how to contact us. If you receive the Ultimate Item of Donated Awesomenessdrop from the Wheel of Doom, you'll find an email address to contact us. Generous heroes can donate their Rare items to a pool of gear kept in Swaggy's Hidden Chest of Wonders. This is the ONLY way rare items will EVER return to the game. 1 donated item 1 1 Ultimate Item winner. Once a month, we'll take all of the Ultimate Item winners and let them choose one of the rare items from the Chest of Wonders! The SUATMR donation prizes Cysero put together are the beginning of the list, but many heroes want to add items to it! Stay tuned for an updated list soon. Once we hear from you and verify that you have the item, we'll select a donated item from the pool of gear donated by your fellow heroes. You asked for changes, and we're making them! We love all our players, and listen to your feedback every day in-game, on Twitter, Facebook, and the forum... then change our plans based on what YOU say! After last night's post about the new Wheel of Doom, we got a lot of comments... and a LOT of questions! Read on for the answers. We are NOT bringing back Rare items! 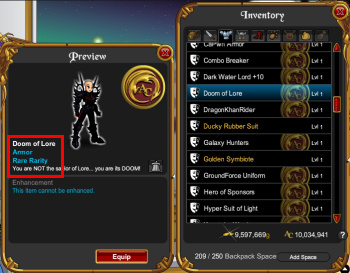 Each item released in AQWorlds has a rarity tag. Different tags have different meanings. 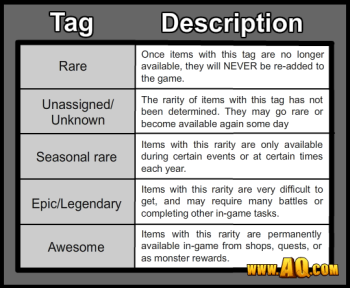 See the chart below to learn the different between a "rare" item, an "unknown" item, and more. ONLY past Quibble items with an "Unknown" rarity are returning. Items marked "RARE" are perma-rare and no more of them will ever be added to the game. You can find out what kind of rarity an item has by clicking on it in your inventory, then looking at the item's details. This is a "Rare" item will NEVER become available again. Because you'll be able to get gold from the Wheel of Doom, we're going to increase the gold cap. We're also investigating how to make gold received from the Wheel of Doom quest ignore the gold cap so you can keep all the gold you get no matter what! Gold rewards from the Wheel of Doom have been adjusted. The new reward amounts are listed in the Wheel of Doom Design Notes post! Cycling Quibble's "Unknown" rarity items in and out! All items in Quibble's current shop are rare! Yup! If you purchased an item from Quibble's current shop, it will automatically turn rare by the end of the day. Quibble and his shop are still here, though! Next Friday, he'll get the DragonKhan Rider, the Legion Raptor Dragonrider, and MAYBE the Archfiend Dragon Rider armors! Free Spins for the Wheel of Doom! Everyone loves to get prizes... and that's why we're giving Legends a free spin EVERY DAY that their upgrade is active! ALL players will get a free spin once a month!